Ah Machu Picchu, it’s a top place on many bucket lists out there. 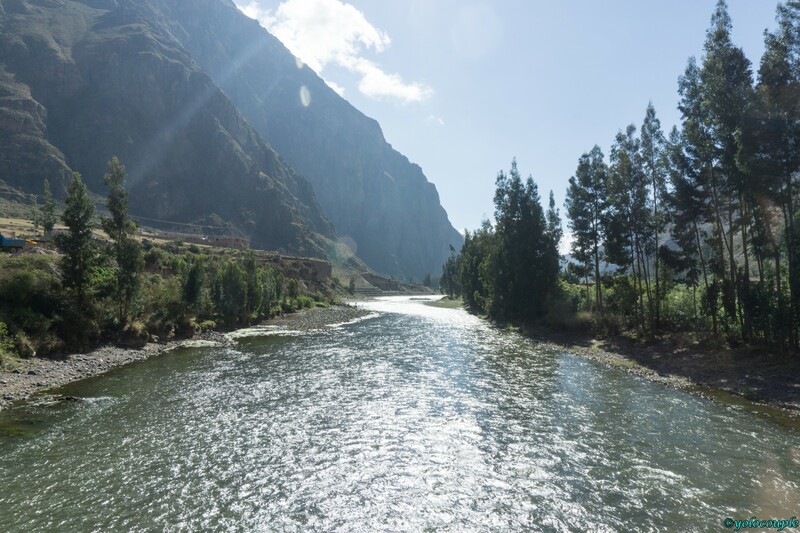 A very popular site in Peru that has attracted many visitors, and for good reasons too! 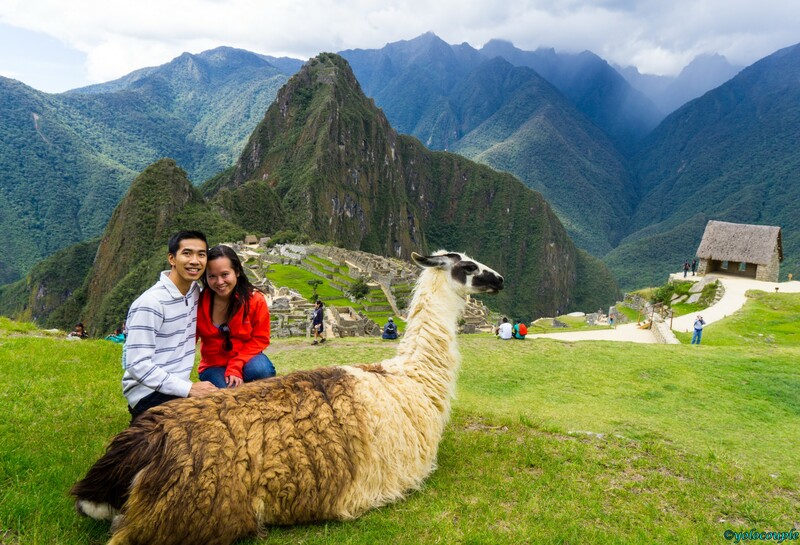 This post will show you how to get to Machu Picchu and provide recommendations for your trip! 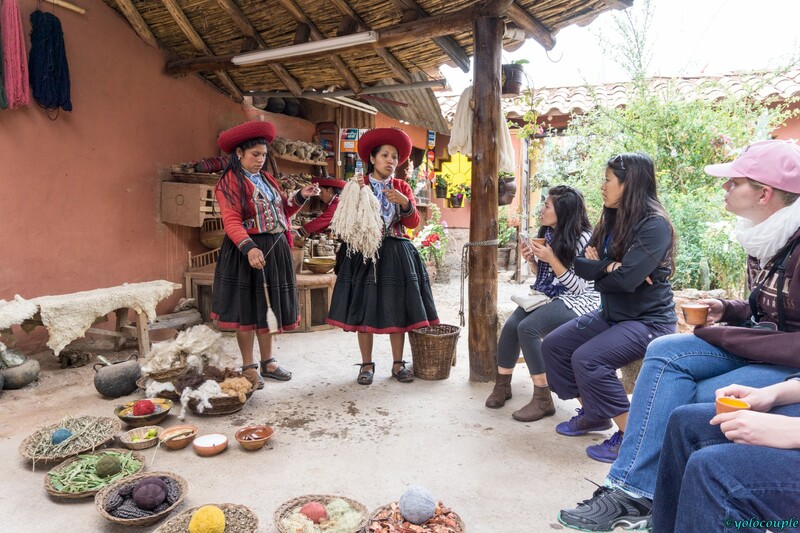 It will also show you what you’ll see on the Sacred Valley tour around the area. So scroll down to read more. First… some photos and an amateur video we created of our trip. Main view of Machu Picchu. I loved this picture as the lighting was just perfect! 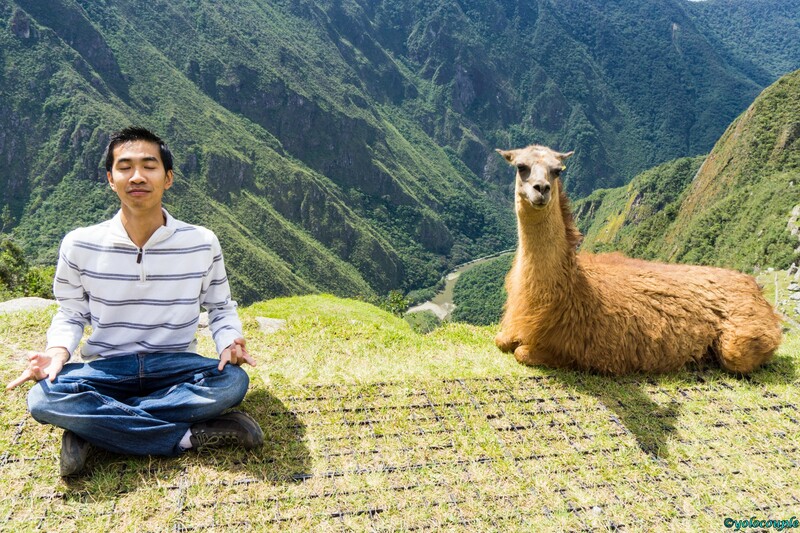 Lots of llamas at Machu Picchu! 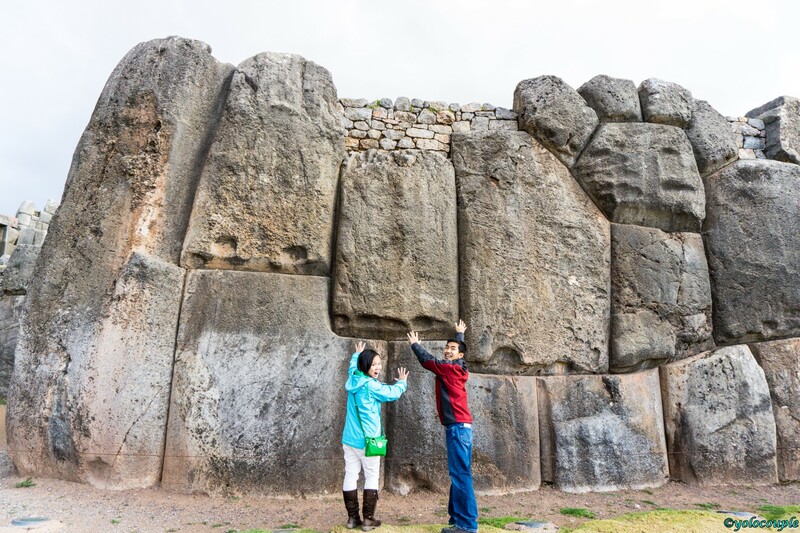 We planned a group trip with our friends to see this world wonder when we saw tickets were on sale from Washington DC to Cusco, Peru, for around $490 per ticket roundtrip on Copa and Avianca Airlines. This was definitely a steal at this price, so we booked it right away. Flights arriving from outside of Peru will always have a layover in Lima first, then you get on another flight to Cusco, the gateway city to Machu Picchu. 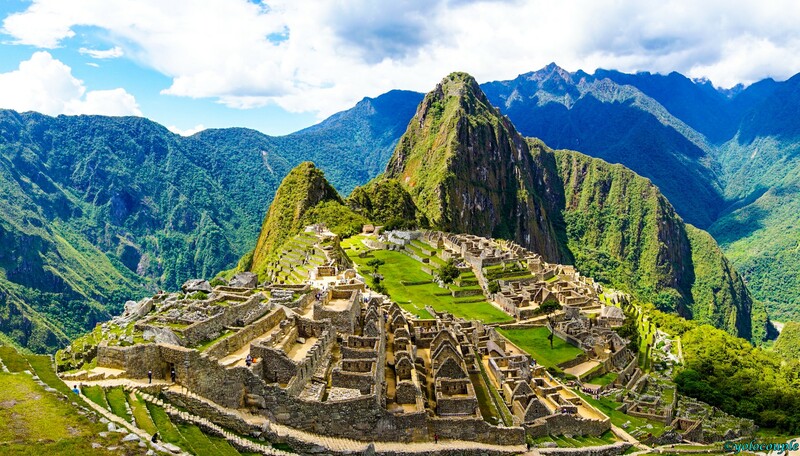 From the USA, keep an eye for flight deals going to Lima, Peru (LIM). Usually a good price would be around $400 – $500 per person. Then you’ll need to buy another flight ticket from Lima to Cusco (CUZ), which is about $120 on average. So be prepared for a few layovers. For example, from Washington DC, our flight flew to Panama, then Lima, then finally Cusco. 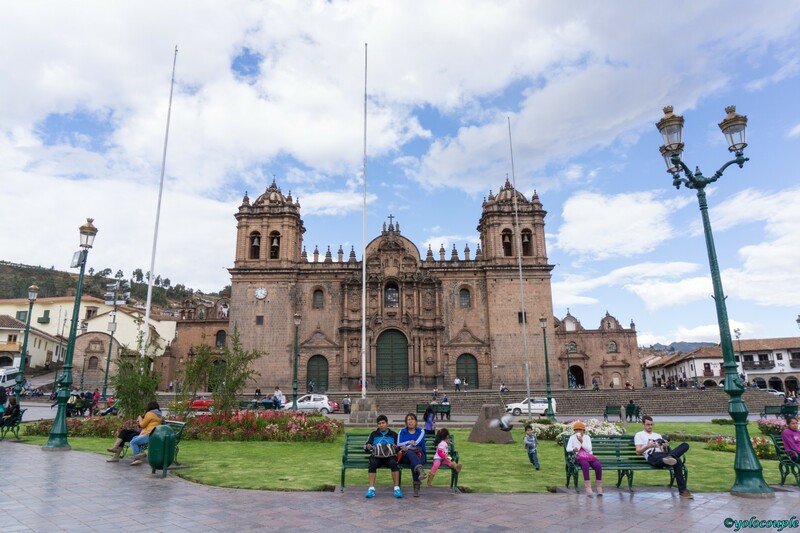 Cusco is the closest city to Machu Picchu, so you will have to fly there first. From Cusco you have several options on seeing Machu Picchu. 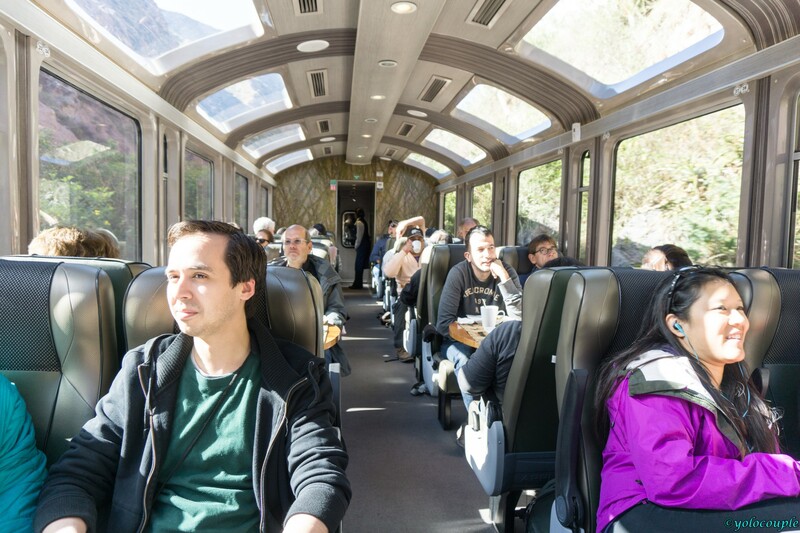 The fastest and most popular option is to take a 3.5 hour train ride directly to the base of Machu Picchu (around $240 USD total cost). The second option is to do the “Inca Trail” (around $600 USD cost) hike that starts about 20 miles away from Machu Picchu, and you must hike for about 4 days to get there. We did the train option as it was the fastest and most convenience based on our schedule. 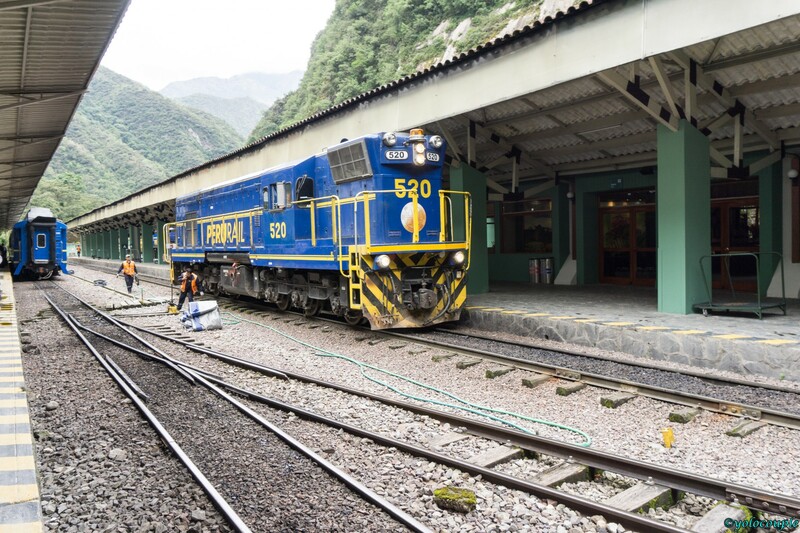 The train tickets can be purchased online at PeruRail website, and it’s best to buy it online early as it can be sold out. Tickets are about $85 each way. At the website, search for tickets from Poroy -> Machu Picchu. Poroy is the closest train station to Cusco. So if you are staying in Cusco, you depart from Poroy. 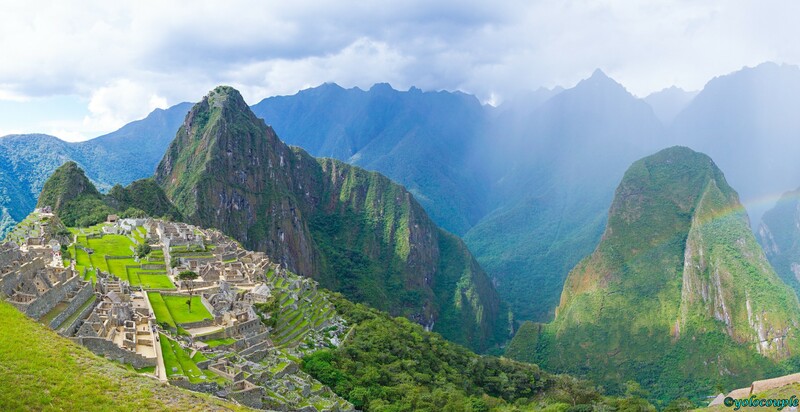 You will also need to buy the actual ticket to enter Machu Picchu, which is about $62 right now. In total, you are looking at around $240 USD for the train ticket and entrance ticket, per person. 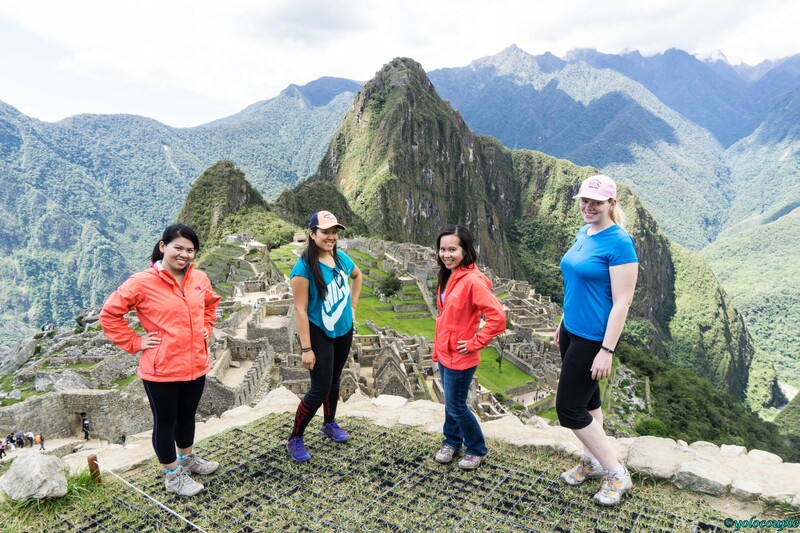 If you decide to do the Inca Trail walk, you’ll have to do it with a tour company, and that will alone cost around $600 per person. 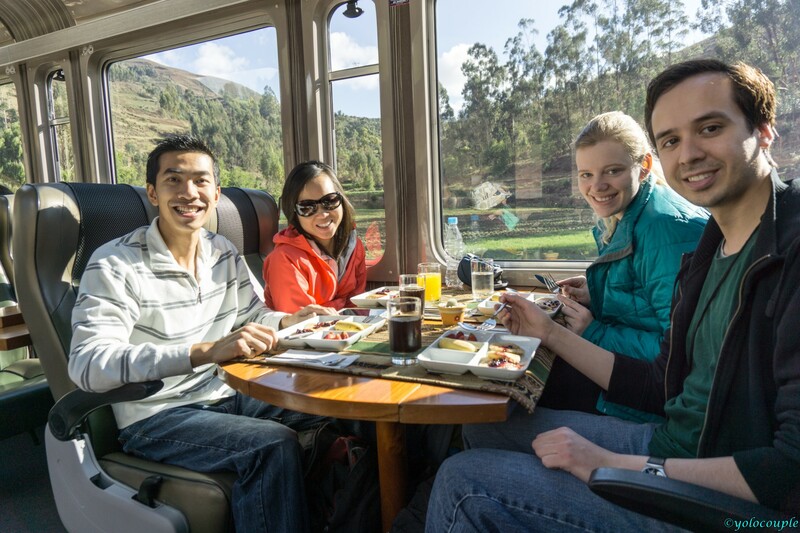 The train departs early in the morning, as early at 6 AM, and there is one returning to Cusco in the afternoon. You can practically see most of Machu Picchu in one day. So you can basically take the earliest train the morning at 6 AM, and take the 3 PM train in the afternoon to get back to Cusco. If you want to stay longer, you can book the train to return the day after. We only went for one day, and found that there are plenty of time to see most of Machu Picchu and take plenty of pictures. Also, don’t forget to bring your passports, as you will need them to board the train! We didn’t know this, and two of our friends didn’t bring theirs and we had to print out a copy and barely made it on the train. The train arrives at a town at the base of the mountain. From here you must take a 15 minute bus ride to the entrance of Machu Picchu. The bus ride goes around the mountain and make very steep and quick turns at the curves. If you get motion sickness easily, you might want to sit up in the front. If you want to climb the mountain seen in the picture of Machu Picchu, you have to buy the ticket to Machu Picchu + Huayna Picchu, which cost about $10 more. Note that the number of climbers allowed up Huayna Picchu is limited, so buy your ticket in advance if you want to go up. If you do plan to climb this mountain though, you will probably want to stay overnight in Machu Picchu as there won’t be enough time for a one day trip. 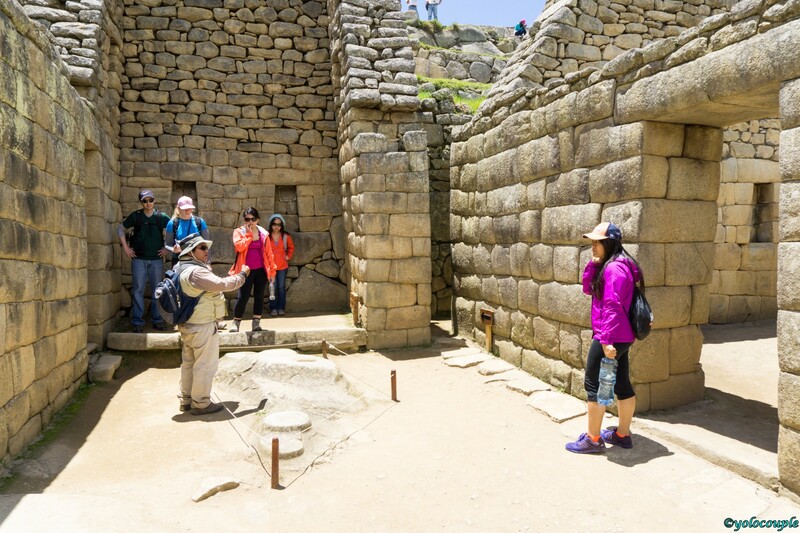 Once at Machu Picchu, there will be plenty of tour guides who will offer to guide you for around $30 – $50 USD for a few hours. This price is per guide, so if you have a large group you can split the cost. I suggest you take the guide as they will be able to explain things to you and show you where to go. Without a guide, the place is pretty big so you might feel a bit lost. 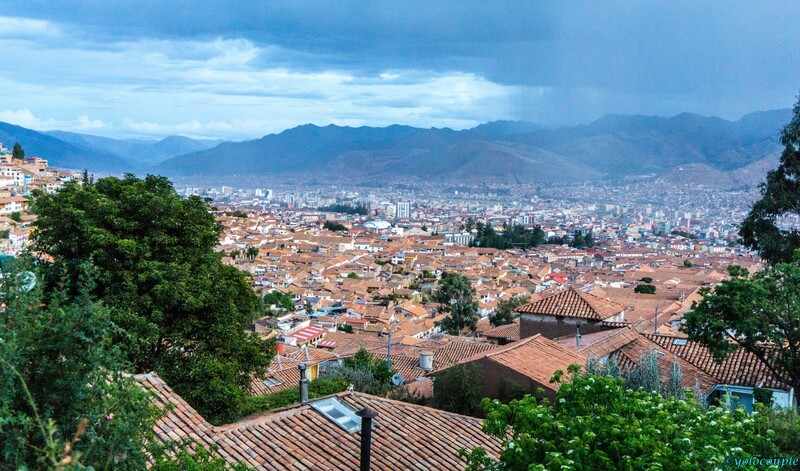 The city of Cusco is one of our favorites! The people are very nice, and food around the area is great and relatively cheap. A dish typically cost around $6 – $10 USD. We stayed at the “Loreto Boutique Hotel ” right next to the town center, Plaza de Armas, and it was always lively day and night. This hotel is in a great location and is about 5 seconds from the main town square. Around the city you will find many markets. 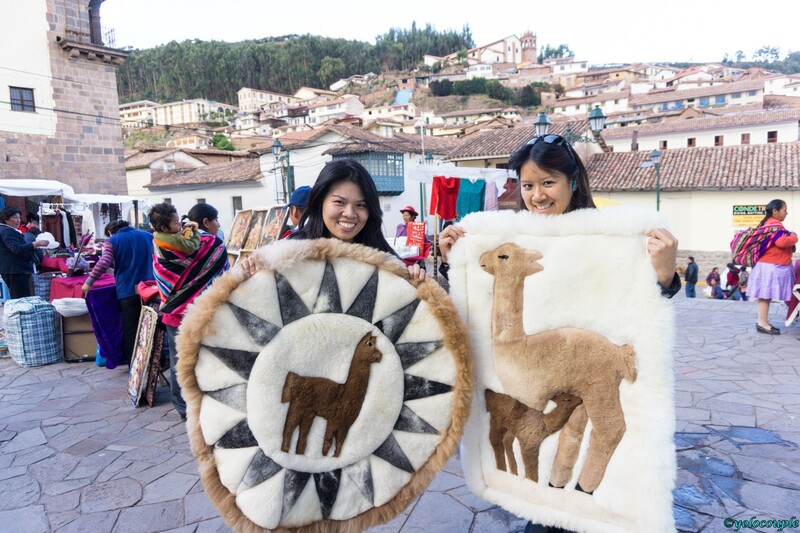 One of their unique items that you can buy is, hats and mini rugs made from Alpaca fur. The fur is very soft and makes great gifts. 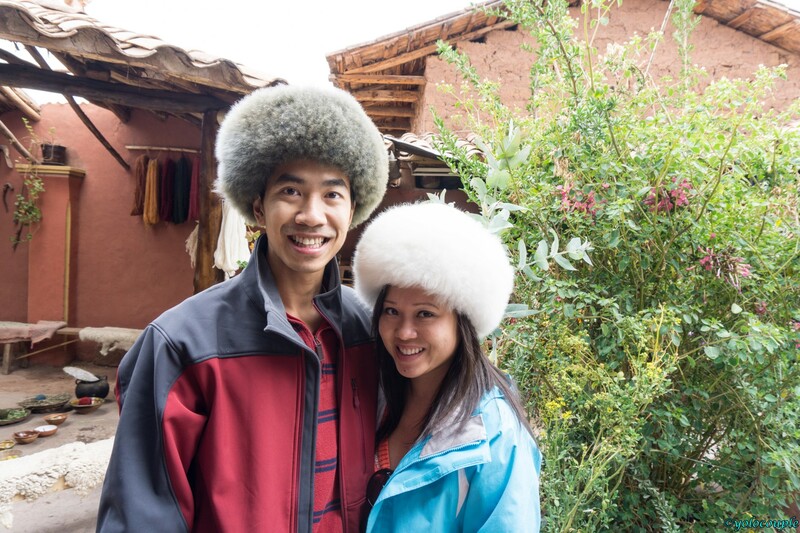 The hats made from Baby Alpaca fur goes for around $25 – 30 USD each. There was a store that opened in the US, selling the same hats for around $100 USD or more. The prices in Cusco were pretty good and we bought a bunch home for family. 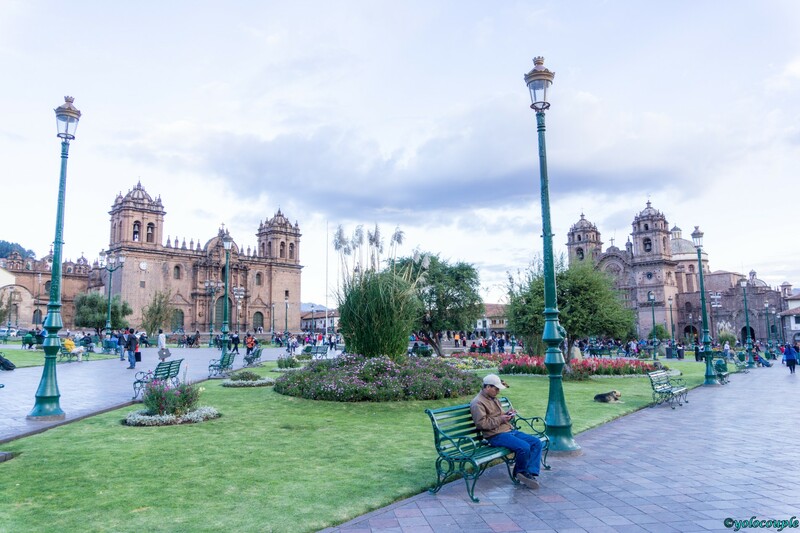 Plaza de Armas – Town center of Cusco. Alpaca rugs, these are bargained down to about $30 each. They sell for much more online and in the US. These make great gifts! Alpaca fur hats. $20 – $30 in Cusco. When in Peru, well you must try their Peruvian chicken! Prices are reasonable at about $6 – $8 per plate. Another famous dish is their roasted guinea pig. 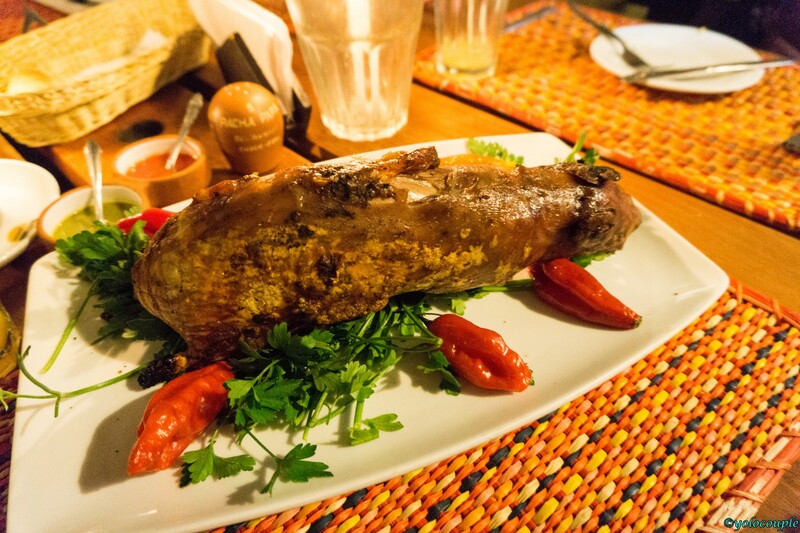 One of the most popular restaurant to try roasted guinea pig is “Pachapapa”. We thought the guinea pig is okay only, as there aren’t much meat and mostly skin and fat. It’s worth a try if you haven’t had it before, but to us it wasn’t that great. The other dishes we ate were pretty good overall. 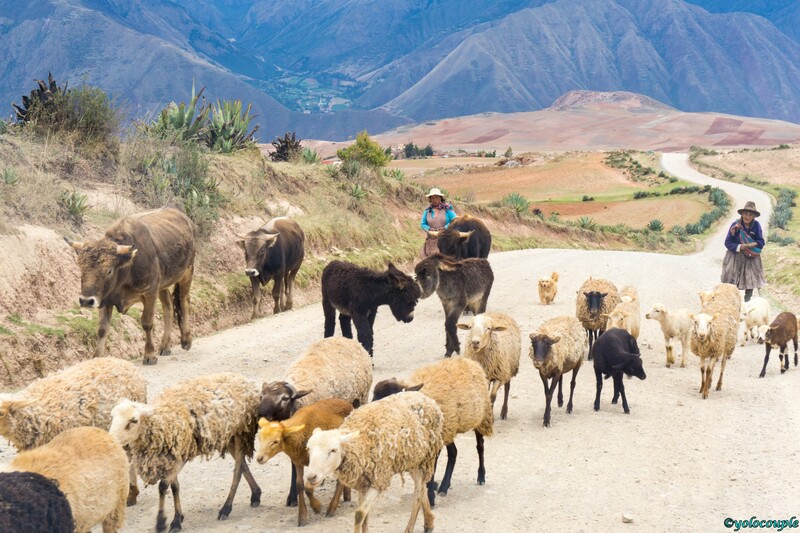 Besides Machu Picchu, you can take a day tour around the Sacred Valley. 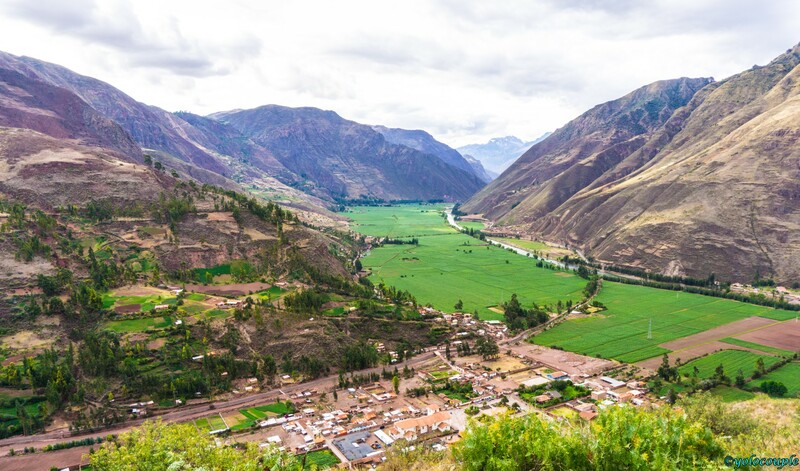 The Sacred Valley basically contains a bunch of sites that your tour driver can take you to see. You can see most of the sites in one day, or two if you want some more time at each site. 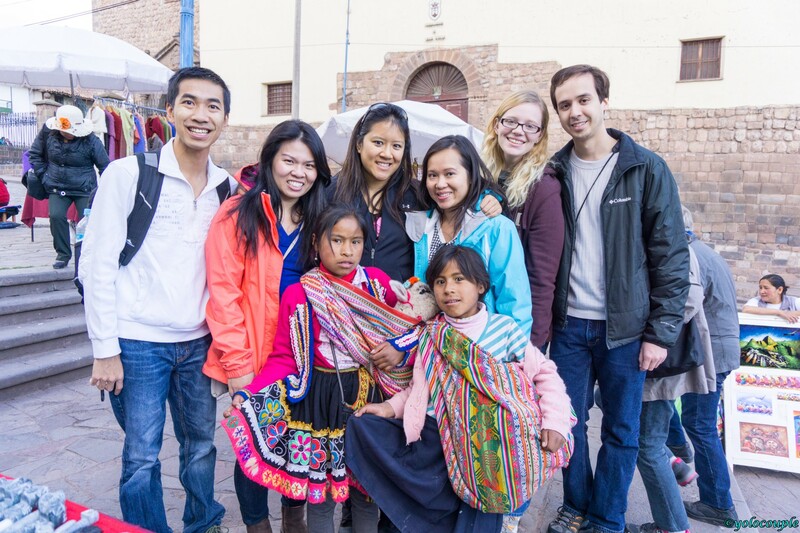 When booking the Sacred Valley tour, make sure you ask them what sites specifically you will be seeing. 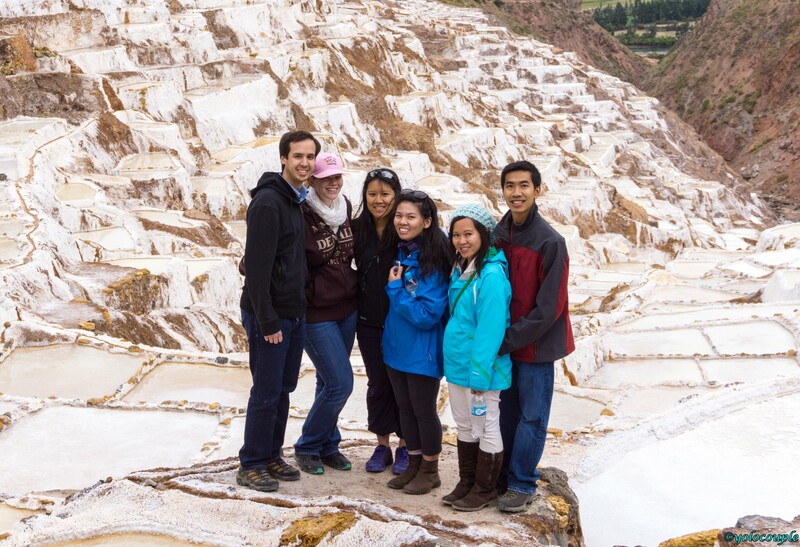 Make sure these are on the list: Maras Salt Pans, Moray Terraces, Pisaq Market, Alpaca Farm, and Sacsayhuaman historical site. 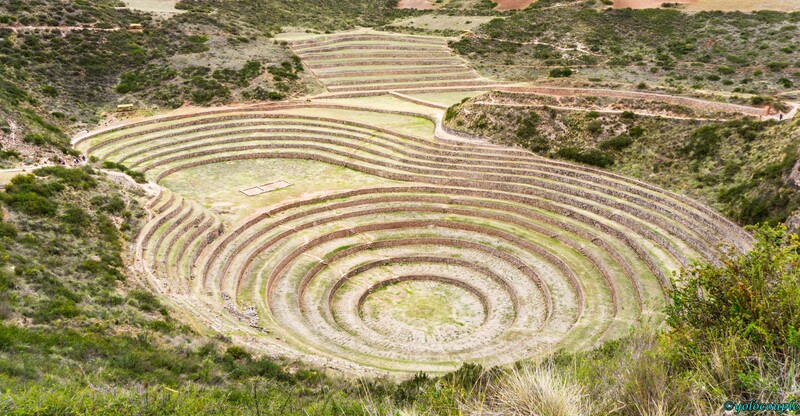 These are some of the major sites in a typical Sacred Valley tour. 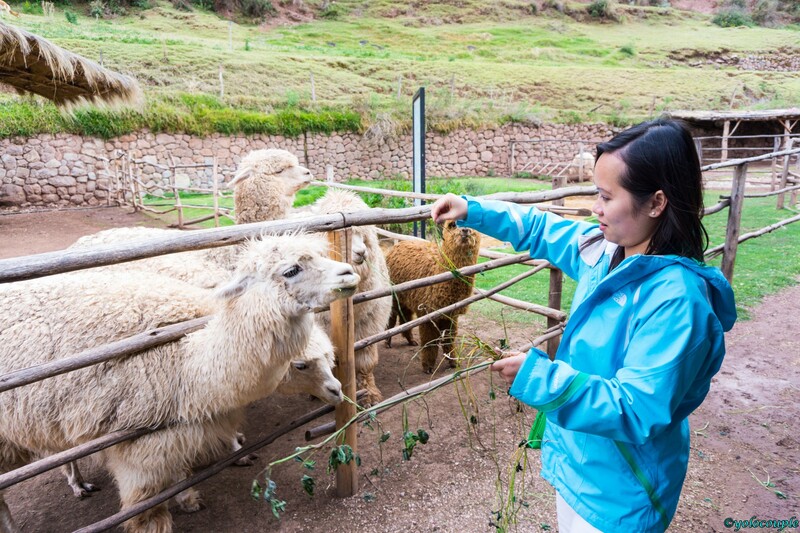 We used the Cusco Peru page on Tripadvisor and contacted several highly rated tour guides. Just contact a few of them to see their prices and what they offer. We used a guide named Munditur Salas (smunditur@hotmail.com) and he was good. His price were $40 per person for an all day tour. Map showing where we went. Blue square area is part of the Sacred Valley tour. The red lines going to Machu Picchu is the train ride. Weaving center – good demonstration of how they make products out of alpaca fur. You do not need to buy unless you want to. 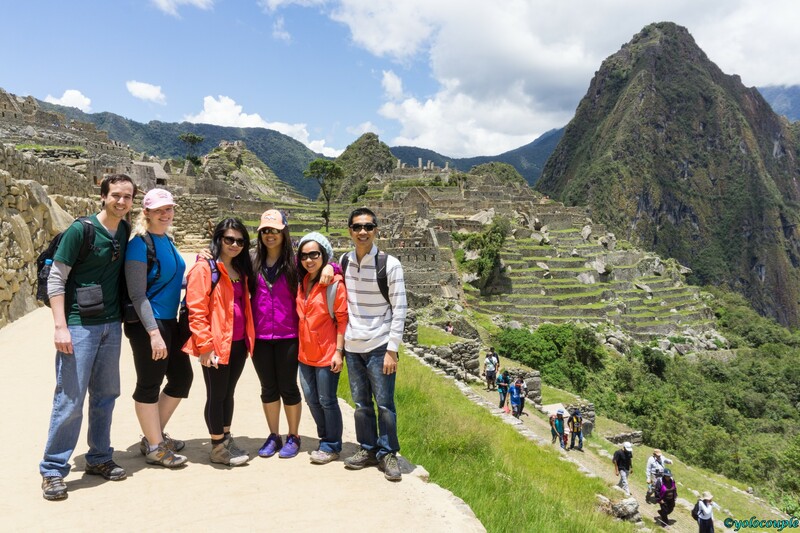 Overall, we all loved our trip to Machu Picchu. The people were nice and everyone had a great time. 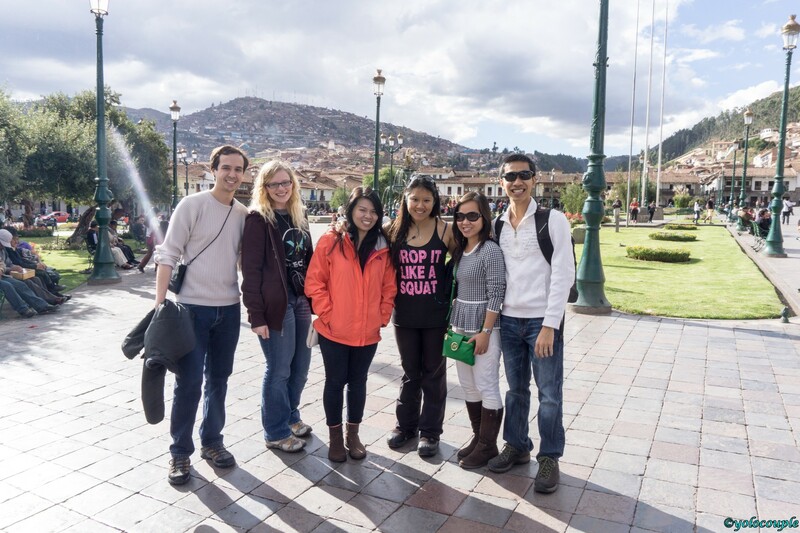 We have been to many cities, and have to say that Cusco is one of our favorite so far!